My first issue was that I couldn't find anywhere where I could record a call in the Lync client. Recording has to be enabled in Lync Control Panel, or Powershell. Browse to Conferencing - Conferencing Policy and edit the appropriate policy (in my case "Global"). You can enable conference and/or peer-to-peer recording, as shown below. When conference recording is enabled, presenters and attendees (or even anonymous participants, if you check the appropriate box) can record the session. This will work with any type of endpoint: Lync users, legacy Communicator users, and PSTN callers. The key here is conferencing. 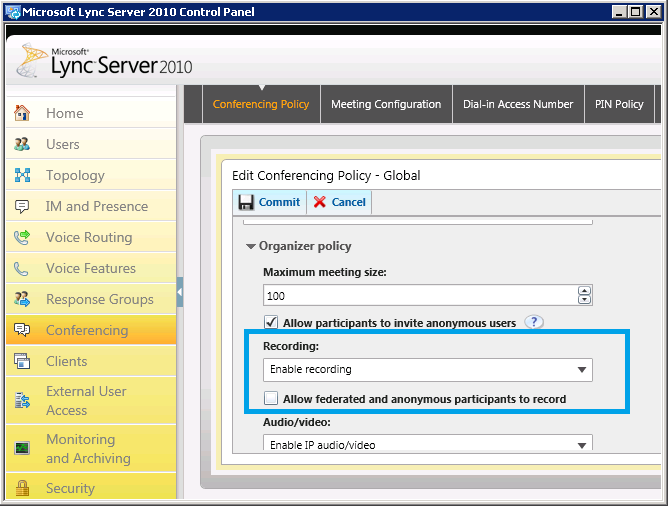 For call recording to be available in this scenario, you must be in a conference with more than one other user/endpoint. For instance, if you call someone via PSTN, you WON'T be able to record the call. If you conference in a second PSTN caller (or Communicator user), you WILL be able to record the call. Peer-to-peer recording ONLY works between Lync clients. You cannot record calls between a Lync user and Communicator user, or PSTN phone number. Interestingly, it appears you also can't record calls made to a Lync phone. To be able to record a call with a PSTN phone number or legacy Communicator client, you must escalate the call to a conference (as shown above). If I add another PSTN caller, Communicator or Lync user, the peer-to-peer PSTN call is escalated to a conference, and I can now record the call. I'm sure there's a very good technical reason why you can only record calls in this manner. Hopefully, the ability to record peer-to-peer PSTN calls will be added in a future release. When recording starts, PSTN callers are notified by voice that the call is being recorded. In Lync, you'll see a notification that the call is being recorded, and you can pause or stop it at any time. 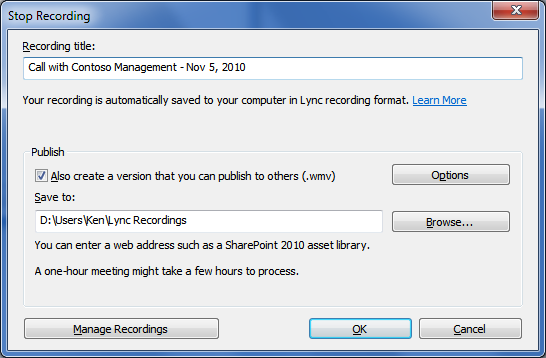 When you either stop recording or finish the call, the Lync Recording Manager kicks in and processes the call content. The user is presented with a screen that allows them to rename the recorded call and save a copy as a WMV file. Options for the WMV recording allow you to select which portions of the call is recorded to WMV format (ie. voice, video, shared content, IM). It can take a while to process a call, so be patient. 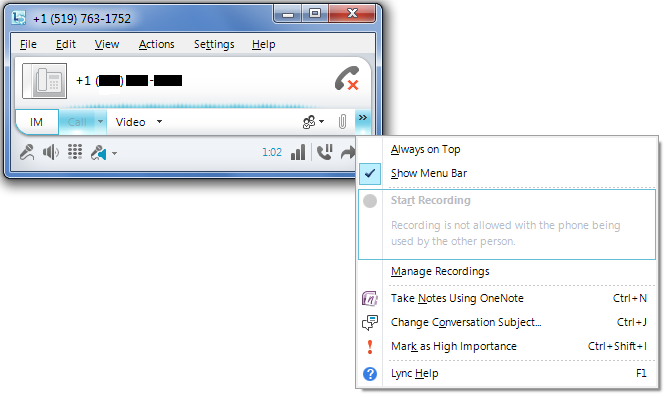 Once processing is complete, you will be notified by a pop-up balloon, which brings up the Lync Recording Manager. 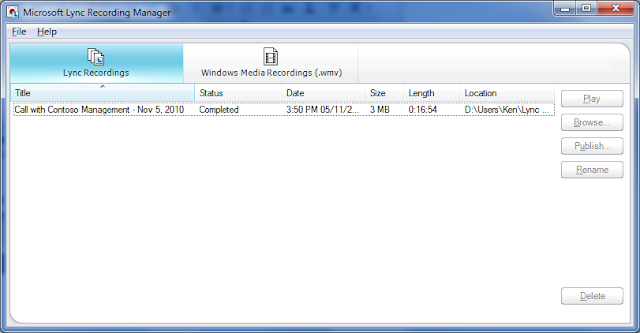 From here, you can view and delete your recordings, both in Lync and WMV format. Lync recordings use an easy-to-navigate interface to choose what content to watch while playing the meeting. WMV recordings starts off with a title card against a black background outlining the name of the conference, the start time, duration, organizer, and attendees. This fades away and the conference begins. If there is only audio recorded, the screen simply shows a simple title card against a black background saying "The meeting has only audio" while the audio plays. If you have video and share content, the video will shrink to a small portion of the screen while the shared content takes up the rest. For my simple tests, the resulting WMV files were quite small (a 1 minute video was 4MB). So, in a nutshell, that's the call recording features available in Lync. This feature will be well-received by anyone who wants to record calls. However, the lack of peer-to-peer recording support for calls with non-Lync endpoints is puzzling. I'm sure there's a very good technical reason why its not available. Hopefully, it will be added in a future release. I have ticked the record peer to peer calls box and setup as above but i cannot record calls from lync to lync? No option in the client? Thanks for the kudos, Anonymous. For Lync recording to work, both users have to be running Lync, and both have to be using a Conferencing policy that allows peer-to-peer recording. Double-check which policy you updated, and which one the users are assigned to. If Automatic policy assiging doesn't seem to work, make sure you explicitly assign a policy. Also, once you apply the policy, it can take a while before it takes effect. Restarting the client can help things along. Thanks for the info. I have checked and double checked and the policy is applied. If i check the user i can see the tick box in peer to peer and the call is from lync to lync? Do i need to install the recording manager? sorry forget last i found recording manager is already installed. Hey there, I wish I could help you out more, but its difficult in this forum. I'm assuming you've restarted your clients well after you made the policy change. I'm curious about your issue though. Email me at ken DOT lasko AT gmail and maybe we can setup a time where we can do a desktop share, and I can try to help you out. also I want know "if there is any tweek to enable peer-to-peer recording (call to pstn)"
for incoming call - add to dialogue another contact from lync and start record. There is a way to work around this limitation if you want to record a Lync to PSTN call. During the call click on the "People Options" button and then on "Invite by Email". When you do this the call will be converted to a conference without adding more people. Simply close the email window that popped up and start recording. So, I've used the "anonymous" workaround and it works MOST of the time. But sometimes, when I "Invite by Email" the email never launches. For example, If I call my cell phone (not in a contact card) I "Invite by Email" and email pops up, I close it, and I can record as suggested. If though, however, I call my boss' cell... and then "Invite by Email" - the email never pops up, it adds another entry/user to the conference, but I cannot record calls. Any help/hints on how to troubleshoot? I am frustrated by the lack of ability to record all phone calls. I also do not want a notice given that the conversationis being recorded. I am a broker and need the recording option for my own reference. You HAVE to give a notice that the call is being recorded. It is ILLEGAL in the U.S. to record a call and not inform the other party that the call is being recorded. does lync has ability to create LISTEN only conference/meeting where when a user joins the meeting they are automatically muted? 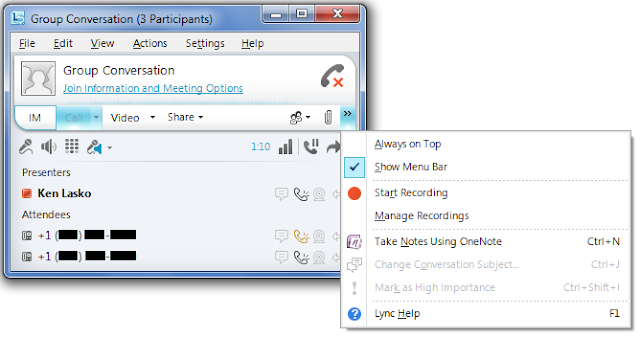 When users join a conference via Lync, they are muted automatically, but can choose to unmute. However, this doesn't seem to apply to PSTN callers. Hi Ken, Awesome post thank you! Just one query for Ken or anyone on this topic; when recording, is any data saved or cached on the server side or is it all client side? The recorded content is stored locally on the client machine. The comment above about recording without notice being illegal in the US is not true. In almost every state but a few, only one party needs to know that a call is being recorded. What about recording with federated partners. We recognized that if we do conferencing with an O365 user or federated partner, our lync recording option is greyed out - but the federated user can record it. If we conference internally, recording works fine. - user "A" has conferencingpolicy with EnableP2PRecording=TRUE, user "A" calls P2P to user "B". User "B" has disabled recording permissions. 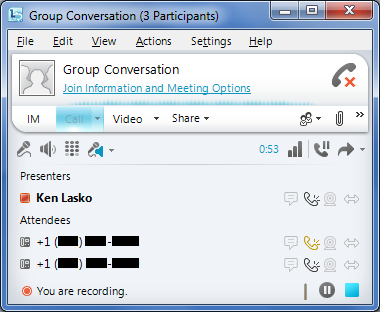 The P2P call on the user "A" side offers the recording button in the UI, BUT the button is grayed out, and the description under the greyed button says: "To start recording, you must invite additional participant into this particular call". This means I cannot start recording in P2P even though my conferencingpolicy allows it, so I must escalate the P2P call into conference to activate the recording button. It turned out, the conferencingpolicy EnableP2PRecording is also observed for the CALLED party as well! As soon as I enabled the P2P recording for user "B", user "A" can click the recording button in the UI, it is not greyed out anymore. However! This approach has the undesired side effekt of granting user "B" the recording functionality, which I dont want to allow. If the user who created the conference has a conferencing policy wich gives him premissions to record, all the presenters have the same premission. In order to fix this, you have to define the other users (guest/company members) as attendees. My scenario is P2P-based, not conferencing-based, UserA "lync-calls" UserB, and during the call UserA wants to do recording, while UserB does not have such a permission to be allowed to do recording on his side. Ken - good article, thank you! I tested recording a video call through Lync, and most of the time I was recording the other person, which I expected. One of the four tests recorded me the whole time, which I did not want; and it makes me nervous to think that it's inconsistent, or at least that I don't understand how it's making the decision of which of us to record. Have you tested this? There are no options in the Recording Options window other than the 'Participant Video' check box, which takes video off the recording altogether. Thanks for your thoughts, Jim. I am trying to use a recording of a Lync conversation in a Lync meeting, for knowledge sharing purposes at work. So I have a very short recording of a conversation between myself and another person saved in the recording manager - is there a way of playing this to an audience in a Lync meeting? I think it would work if you save your recording as a WMV file. You should be able to share WMV A/V files in a conference. Make sure you upload it well before your meeting starts, so there's no delay for your audience. We have enabled recordings in conferences and multiparty conversations. However, we would like to add a custom text in the Lync client informing that the session can be recorded. The text once added will be displayed in both peer-to-peer and conference sessions but we want it to be restricted to conference/multiparty sessions. Do you know if this possible ?